On 22 May 2010, a Boeing 737-800 passenger jet operating Air India Express Flight 812 from Dubai to Mangalore, India, crashed on landing at Mangalore. The Captain had continued an unstabilized approach, despite three calls from the First Officer to "go around", resulting in the aircraft overshooting the runway, falling down a hillside and bursting into flames. Of the 160 passengers and six crew members on board, only eight passengers survived. VT-AXV, the aircraft involved in the accident in 2008. Runway overrun due to pilot error. Location of the accident shown within India. With its 158 fatalities, Flight 812 remains the deadliest accident involving the Boeing 737 Next Generation aircraft and was the deadliest accident involving all variants of Boeing 737 until Lion Air Flight 610 crashed in 2018 with 189 fatalities, and the third deadliest aviation disaster in India, after the 1996 Charkhi Dadri mid-air collision and the 1978 crash of Air India Flight 855. The accident involved a Boeing 737-8HG(SFP), one of the few 737s with Short Field Performance package to use for landing in airports with short runways, with the aircraft registration VT–AXV and manufacturer's serial number 36333, line number 2481. The aircraft first flew on 20 December 2007 with the Boeing test registration N1787B and was delivered a month later. The crew consisted of Captain Zlatko Glušica, First Officer Harbinder Singh Ahluwalia and four flight attendants. Glušica, aged 55, was a former employee of Jat Airways of Serbia, a British and Serbian national with over 10,000 hours of flying and over 7,500 hours of command experience, and Ahluwalia was a former employee of Jet Airways who joined Air India Express in 2009; both pilots were based in Mangalore. The flight departed Dubai International Airport at 01:06 GST (21:06 UTC). It crashed upon landing at Mangalore International Airport at 06:05 IST (00:35 UTC). Situated in a hilly area, the airport is one of seven Indian airports designated as a "critical airfield" by the Directorate General of Civil Aviation (DGCA). DGCA rules at critical airfields prohibit "supervised take offs and landings", so that only the captain (not the first officer) may pilot an aircraft during take-off and landing. The airport is one of three airports in India having table top runways (the others being Kozhikode and Lengpui) that require heightened awareness and a very precise landing approach. After touching down on the 8,033-foot (2,448 m) runway 24, the plane overran and crashed down the hill at its far end. The final conversations between Air traffic control (ATC) and the pilot prior to the landing showed no indication of distress. Television footage from shortly after the crash showed the remains of the aircraft on fire and lying on its belly with smoke rising from the wreckage. The minister also stated that weather conditions were normal with a visibility of 3.7 miles (6.0 km), and said wind conditions were calm and there was no rain at the time of the crash. A drizzle started only after the accident. Apart from the six crew members, a total of 160 passengers were on board at the time of the crash. Although there were 169 names on the original passenger list, nine did not board the flight. All the bodies were recovered from the wreckage. Karnataka Home Minister V. S. Acharya said eight people were initially reported to have survived, although one later died of his injuries—this was however refuted by an Air India spokesman who confirmed that all initial survivors were alive. The confusion arose after fire fighters rescued a little girl who died on the way to hospital. The airport manager at Mangalore, Peter Abraham confirmed that there were difficulties when trying to reach the plane. On 27 July 2010, the names of all the victims were inscribed on a memorial installed near the crash site which was destroyed by vandals on 5 October 2010. Members of the public services were assisted by local volunteers in a joint rescue operation at the scene of the crash. "The plane broke in two", said one survivor, "and a dense black smoke invaded the cabin. I jumped out through an opening in the window. Six other passengers followed me. We fled, with the help of the inhabitants of the nearby village". Local villagers were among the first on the scene to help, while an estimated 15 fire trucks, 20 ambulances and 100 rescue workers were immediately allocated to rescue operations. The Karnataka Western Range Inspector General of Police, Gopal Hosur, said that eight to ten people had been moved to hospitals and that the Karnataka Police force, bomb squad, Karnataka Fire and Emergency Services, Karnataka State Reserve Police and all hospitals were working together to help out. The Central Industrial Security Force (CISF) sent 150 personnel to Mangalore to help in the relief and rescue operations. Bodies of all of the deceased were recovered from the crash site on the day of the crash, with relatives of the deceased receiving 87 of the bodies. After the rapid establishment of a special emergency information service, Praful Patel, the Indian Minister for Civil Aviation, arrived from New Delhi to be at the scene and the one-year-in-office celebrations of the UPA government's second tenure were postponed. Patel was soon followed by Karnataka Chief Minister B. S. Yeddyurappa and Kerala Chief Minister V. S. Achuthanandan to take control of the situation. The chairperson of the governing UPA, Sonia Gandhi issued a message of grief and wished a "speedy recovery" to all. Patel took moral responsibility for the accident and offered to resign his post, an offer rejected by the Prime Minister of India, Manmohan Singh. Many countries and organisations expressed sorrow and condolences to the people of India over the crash. The accident was predicted to cost the insurers and their reinsurers ₹4 billion (US$60 million). Air India's insurance company paid out ₹900 million (US$10 million) in settlement of the hull loss, and the company had already received ₹1.38 billion (US$20 million), that is 60 per cent of the estimated ₹2.3 billion (US$30 million). Initial investigations revealed that the plane landed at least 2,000 feet (610 m) beyond the usual touch down point on Mangalore's new 8,040-foot (2,450 m) runway 24. A team of airline officials, staff and officials from the Airports Authority of India and officers of the Directorate General of Civil Aviation were rushed to the scene to investigate the accident and assist with rescue efforts. Boeing also announced that a team would be sent to provide technical assistance following a request from Indian authorities. The Directorate General of Civil Aviation ordered an inquiry into the crash, which began the same day. The US National Transportation Safety Board (NTSB) also assisted the investigation by sending a team of specialists including a senior air safety investigator, a flight operations specialist, an aircraft systems specialist and technical advisers for Boeing and the Federal Aviation Administration. Captain Glušica was given clearance to land; however, he suddenly aborted the attempted landing. The aircraft's throttle handle was found in the forward position, suggesting that the pilot had attempted to abort the landing and take off again. The co-pilot Ahluwalia had warned his commander three times to go around instead of landing; the first of these warnings had come 2.5 miles (4.0 km) before the runway threshold. The cockpit voice recorder (CVR) was recovered on 23 May, and the flight data recorder (FDR) two days later. The recorders were sent to New Delhi by the Directorate General of Civil Aviation for data acquisition and analysis and subsequently to the US NTSB for investigation. DGCA official Zaidi claimed "better data protection" while unnamed officials mentioned heavy damage to the devices. In direct response to the accident the Government of India decided to set up an independent air accident enquiry board called the Civil Aviation Authority that would function independently of the DGCA. Effectively this meant that the DGCA would be the regulator and the CAA the investigator. The Director General of the DGCA said that it would be set up though legislation, and would comply with the recommendations of the International Civil Aviation Organization. The enquiry report submitted by the Civil Aviation Ministry said that Glušica slept for over 90 minutes during the flight. According to the NTSB, it was the first instance of snoring recorded on a cockpit voice recorder. Analysis of the accident revealed that had the pilot "deployed détente reverse thrust and applied maximum manual braking at touchdown", the aircraft could have been stopped within the paved overrun area of the runway. The captain had exacerbated the long landing by attempting a go-around following deployment of the thrust reversers. On 3 June 2010, the Government of India appointed the Former Vice Chief of Air Staff, Air Marshal Bhushan Nilkanth Gokhale, as head of a Court of Inquiry to investigate the air crash. The "Gokhale Inquiry" was to investigate the reasons behind the crash and submit its findings by 31 August 2010, a deadline later extended by a month to 30 September 2010. The Government also appointed four experts to this Court of Inquiry to assist in the investigation. The Court of Inquiry started its investigations by visiting the crash site on 7 June 2010, and visited all eight crash survivors to gather information. On 17 August 2010, the Court of Inquiry began a three-day public hearing in Mangalore to interview airport officials and witnesses. On day one, airport and airline officials deposed that the aircraft had approached at an altitude higher than usual, and that it had landed beyond the landing zone (LDZ). They also mentioned that the airport's radar was operational from 20 May 2010. The airport chief fire officer testified that crash tenders had taken four minutes to reach the aircraft because the road leading away from the airport perimeter to the crash site was very narrow and undulating. On day two, a transcript of the cockpit to ATC conversation was released, which indicated that the co-pilot had suggested a "go around" after the pilot informed ATC that it was 'clear to land'. Doctors who conducted post mortems on the bodies recovered recorded that most victims had died of burns. On day four Air India's flight safety officer informed the inquiry that the aircraft's thrust lever and thrust reverse levers were both in the forward position, possibly indicating that the pilot intended to go around. The inquiry panel stated that information from the FDR would be released at the next hearing of the Court of Inquiry in New Delhi on 3 September 2010, and that of the CVR soon after. The Court of Inquiry would submit its report on 30 September 2010. On 8 September 2010, details from the CVR and FDR were presented to the Court of Inquiry. The CVR analysis revealed that one of the pilots was asleep in the cockpit. For 110 minutes the CVR had picked up no conversation from the pilots, with the report adding that the sound of nasal snoring and deep breathing could be heard during this recording. The FDR analysis indicated that the flight started its final descent at an altitude of 4,400 feet (1,300 m), instead of the normal 2,000 feet (610 m). The aircraft also touched down at the 4,638-foot (1,414 m) mark on the runway instead of the 1,000-foot (300 m) mark, whereupon the pilot then tried to take off with just 800 feet (240 m) of the runway remaining, which resulted in the crash. Both pilots had been aware of the wrong flight path since they are both heard saying "Flight is taking wrong path and wrong side", while the aircraft's instruments had given repeated warnings of this. On 16 November 2010, five months after the Court of Inquiry was constituted, it submitted its report with input from the NTSB and Boeing, and stated that pilot error was the cause of the accident since the flight path was incorrect. As of January 2013[update], the DGCA, AAI and Ministry of Aviation, and the Government of India have not implemented the recommendations of the 812 crash inquiry committee. Work on runway lengthening has not started. 812 Foundation, a Mangalore-based trust, has filed criminal charges for negligence against regulatory authorities and the airline. The regulatory authority and other organisations named in the petition are thinking of seeking anticipatory bail for their top officials, as the petition seeks non-bailable arrest warrants against those responsible. The then Prime Minister of India, Manmohan Singh, announced ₹200,000 (US$2,800) (€3,390) for the families of the dead and ₹50,000 (US$700) for the injured to be allocated from the Prime Minister's National Relief Fund. Karnataka Chief Minister Yeddyurappa had also announced compensation of ₹200,000 (US$2,800) to the families of the dead. In addition to this, the Civil Aviation Ministry advised that the Airline will provide up to ₹7.2 million (US$100,190) to family members of each victim as per the provisions of the Indian Carriage by Air (Amendment) Act which follows the Montreal Convention. The airline announced interim compensation of ₹1 million (US$13,910) for passengers above 12 years of age, ₹500,000 (US$7,000) for passengers below 12 years of age and ₹200,000 (US$2,800) for every injured passenger. This compensation is over and above the ex-gratia payment announced by the Prime Minister. Additionally, Air India has said it would offer jobs to the survivors. As of 11 June 2010 an amount of ₹170 million (US$2 million) had been distributed as compensation to the families of the victims and to the eight survivors. Victims' families have become increasingly vocal as to the inequitable nature of compensation paid out by Air India, and also of the alleged hostile attitude of the airline's counsel. Members of the Democratic Youth Federation of India (DYFI) along with Kasargod MP P Karunkaran staged a protest on 8 September 2010 at the airline's office in Mangalore where they submitted a memorandum to officials demanding that families of the victims receive early and equitable settlements of compensation due. They also demanded the settlement process be made more transparent by opening it to the media rather than holding sessions in camera. On 20 July 2011, based on the petition filed by one of the victims, the Kerala High Court ruled that Air India was liable to pay a no fault liability of one lakh SDR or the Indian rupee equivalent of ₹7.5 million (US$104,360). In its ruling the court noted that India was a signatory to the Montreal Convention: "It is clear that the intention of lawmakers was to bring about a parity in the matter of payment of compensation to the passengers, irrespective of class of travel, while providing for a 'two tier system' of compensation as adopted in Montreal convention." The court further ruled that this was over and above any other compensation that the petitioners are entitled to. Air India appealed this order in the Kerala High Court and on 25 August 2011, the division bench stayed the single bench order on compensation of ₹7.5 million (US$104,360). However, on 5 September 2011 the Kerala High Court ordered Air India to pay an interim compensation of ₹1 million (US$13,910). Wikimedia Commons has media related to Air India Express Flight 812. Air France Flight 358, an Airbus A340 which overshot the runway when landing at Toronto Pearson International Airport in 2005. American Airlines Flight 1420, a McDonnell-Douglas MD-80 which overshot the runway during a landing at Little Rock International Airport in 1999. Indian Airlines Flight 557, an aircraft that overshot runway 27 at the same airport in 1981. TAM Airlines Flight 3054, an Airbus A320 which overshot the runway while landing at Congonhas Airport in 2007; with a total of 199 fatalities, this was the deadliest plane crash in Brazil and the deadliest crash of an A320 in history. ^ TDZ – Touch Down Zone v/s touch down point. By definition, the touchdown zone normally extends over the first 3,000 feet (910 m) of runway and the pilot aims to touch down at a point that is well within the limits of the zone, typically around the 1,000 feet (300 m) mark for a B737. The zone gives leeway to account for variations in physical conditions such as adverse winds, optical illusions due to day/night/rain/sloping terrain, equipment malfunctions, piloting technique etc. One of the demands of a critical airfield is to land accurately, as close as possible to the planned touch down point. ^ a b c d "Air India Express IX-812 Accident – Press Release 5". Air India. 22 May 2010. Archived from the original on 17 March 2012. Retrieved 22 May 2010. ^ "List of passengers on Air India Express flight". The Hindu. 22 May 2010. Archived from the original on 15 February 2012. Retrieved 22 May 2010. ^ a b c d e "Air India Express IX-812 Accident – Press Release 6". Air India. 23 May 2010. Archived from the original on 17 March 2012. Retrieved 23 May 2010. 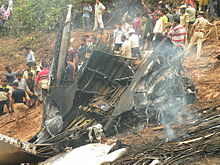 ^ a b c d e "Plane crash in Mangalore kills 158, eight survive". Hindustan Times. India. 22 May 2010. Archived from the original on 15 February 2012. Retrieved 22 May 2010. ^ a b "India plane crash kills scores; 8 survive". MSNBC. 22 May 2010. Archived from the original on 19 February 2012. Retrieved 11 June 2010. ^ a b "India plane crash in Mangalore leaves nearly 160 dead". BBC News. 22 May 2010. Archived from the original on 19 February 2012. Retrieved 22 May 2010. ^ "Mangalore: The Lucky 8 who Survived..." Daijiworld Media. 23 May 2010. Archived from the original on 1 March 2012. Retrieved 10 August 2010. ^ a b "Probe ordered into Air India plane crash; 158 dead, 8 survivors". Zee News. 23 May 2010. Archived from the original on 17 March 2012. Retrieved 23 May 2010. ^ a b "List of passengers on board IX-812". Archived from the original (PDF) on 17 March 2012. Retrieved 11 April 2011. ^ "ASN Aviation Safety Database results". Aviation Safety Network. 8 May 2011. Archived from the original on 1 March 2012. Retrieved 11 April 2011. ^ a b c d e f g Bonnett, Tom (22 May 2010). "India Plane Overshoots Runway: 158 Dead". Sky News. Archived from the original on 1 March 2012. Retrieved 22 May 2010. ^ a b c "AI plane crashes in Mangalore, 158 dead". CNN-IBN. 22 May 2010. Archived from the original on 20 February 2012. Retrieved 22 May 2010. ^ a b c "Accident description". Aviation Safety Network. 27 April 2011. Archived from the original on 1 March 2012. Retrieved 22 May 2010. ^ "VT-AXV Air India Express Boeing 737-8HG(WL) – cn 36333 / ln 2481". Planespotters.net. Retrieved 22 May 2010. ^ a b "List of Crew". Air India. Archived from the original on 17 March 2012. Retrieved 22 May 2010. ^ Staff Writer (22 May 2010). "We had no hope of surviving'". CNN-IBN. Archived from the original on 1 March 2012. Retrieved 22 May 2010. ^ "Crash: Air India Express B738 at Mangalore on 22 May 2010, overran runway on landing". The Aviation Herald. 26 April 2011. Retrieved 9 February 2012. ^ "Aeronautical Information Circulars". Dgca.nic.in. Archived from the original on 20 September 2010. Retrieved 10 August 2010. ^ "NEW DELHI-110003" (PDF). Government of India, Aeronautical information Services. 6 December 2007. Retrieved 11 April 2011. ^ "Mangalore airport tests pilot's skills: Krishna". Zee News. India. 22 May 2010. Archived from the original on 7 March 2012. Retrieved 10 August 2010. ^ "Hi-fliers on a high". The Hindu. 16 December 2006. Archived from the original on 7 March 2012. Retrieved 10 August 2010. ^ "Indian skies are safe for flying: Kanu Gohain, Ex-Director General, DGCA". The Economic Times. India. 23 May 2010. Archived from the original on 7 March 2012. Retrieved 23 May 2010. ^ "Tabletop runway creates an optical illusion, says pilot". The Hindu. Chennai, India. 23 May 2010. Archived from the original on 7 March 2012. Retrieved 23 May 2010. ^ "Last conversation between ATC and IX 812 – India News – IBNLive". CNN-IBN. 3 February 2010. Archived from the original on 7 March 2012. Retrieved 10 August 2010. ^ Chand, Naseeb (21 May 2010). "More than 60 feared dead after India plane crash". AFP. Archived from the original on 25 May 2010. Retrieved 9 February 2012. ^ "158 killed in Mangalore air crash; 8 survive". The Hindu Business Line. 22 May 2010. Archived from the original on 14 March 2012. Retrieved 10 August 2010. ^ a b "Air India's flight data recorder sought". CNN. 24 May 2010. Archived from the original on 14 March 2012. Retrieved 23 May 2010. ^ Mondal, Sudipto (22 May 2010). "158 killed as plane crashes at Mangalore". The Hindu. India. Archived from the original on 20 February 2012. Retrieved 22 May 2010. ^ Mines, Javier (22 May 2010). "Eight survive Air India Express Flight 812 crash in Mangalore, 158 others die". Wireupdate.com. Archived from the original on 14 March 2012. Retrieved 28 April 2011. ^ "158 killed in air crash; 25 bodies unidentified". CNN-IBN. 23 May 2010. Archived from the original on 14 March 2012. Retrieved 12 June 2010. ^ "Mangalore Plane Crash: Survivors' stories". Livestreamingx.com. 22 May 2010. Archived from the original on 14 March 2012. Retrieved 11 April 2011. ^ "Mangalore crash: Parents of Bangla survivor granted Indian visa". The Economic Times. 23 May 2010. Archived from the original on 14 March 2012. Retrieved 24 June 2010. ^ "Mangalore: Memorial Comes Up at AIE Crash Site – Due Recognition for 158 Victims". Daijiworld Media. 5 October 2010. Archived from the original on 14 March 2012. Retrieved 5 October 2010. ^ "Mangalore: Unknown Miscreants Demolish Air Crash Victims' Memorial". Daijiworld Media. 5 October 2010. Archived from the original on 14 March 2012. Retrieved 5 October 2010. ^ Carvalho, Nirmala (24 May 2010). "Mangalore, survivor tells of air disaster". Asia News. Retrieved 5 August 2010. ^ "Heroes of Mangalore air crash". NDTV. 22 May 2010. Archived from the original on 13 March 2012. Retrieved 23 May 2010. ^ Magnier, Mark (22 May 2010). "Air India plane crashes, killing at least 160 people". Los Angeles Times. Archived from the original on 13 March 2012. Retrieved 22 May 2010. ^ "Mangalore air crash: All 158 bodies recovered". NDTV. 22 May 2010. Archived from the original on 13 March 2012. Retrieved 11 June 2010. ^ "At least 158 dead in Mangalore plane crash". Times of India. 22 May 2010. Archived from the original on 1 March 2012. Retrieved 1 March 2012. ^ "Praful Patel Meets PM, Offers to Resign". Hindu Business Line. 23 May 2010. Archived from the original on 13 March 2012. Retrieved 23 May 2010. ^ "Jerzy Buzek Sends Condolences Following Plane Crash in India". EU Monitor. 22 May 2010. Archived from the original on 13 March 2012. Retrieved 22 May 2010. ^ "Mangalore crash: Insurers may have to shell out Rs 400 crore". Times of India. 24 May 2010. Archived from the original on 13 March 2012. Retrieved 25 May 2010. ^ a b "AI to get $20 million towards Mangalore crash insurance claims". Times of India. 11 August 2010. Archived from the original on 13 March 2012. Retrieved 11 August 2010. ^ "Mangalore crash: AI gets $50m insurance claim". The Times of India. 17 August 2010. Archived from the original on 13 March 2012. Retrieved 17 August 2010. ^ Hradecky, Simon (3 August 2010). "Crash: Air India Express B738 at Mangalore on May 22nd 2010, overran runway at landing". The Aviation Herald. Retrieved 22 May 2010. ^ Proulx, Jim (21 May 2010). "Boeing statement on Air India Express accident". Boeing. Archived from the original on 25 May 2010. Retrieved 1 June 2010. ^ "Air India jet crash investigation begins in Mangalore". BBC News. 22 May 2010. Archived from the original on 7 March 2012. Retrieved 22 May 2010. ^ "Air India plane crash: 'Sleepy' pilot blamed". BBC News. London. 17 November 2010. Archived from the original on 11 March 2012. Retrieved 11 March 2012. ^ a b Sinha, Saurabh (31 May 2010). "Mangalore crash: Captain ignored co-pilot's plea to abort landing". Times of India. Archived from the original on 11 March 2012. Retrieved 1 June 2010. ^ "CVR affected by fire but will yield data: DGCA". The Hindu. 24 May 2010. Archived from the original on 11 March 2012. Retrieved 24 May 2010. ^ "India crash investigators recover data recorder". BBC News. 25 May 2010. Archived from the original on 11 March 2012. Retrieved 25 May 2010. ^ "Mangalore air crash: Black Box found". NDTV. 23 May 2010. Archived from the original on 11 March 2012. Retrieved 23 May 2010. ^ a b Nandy, Chandan (27 May 2010). "Black box, CVR to go to US". Deccan Herald. Archived from the original on 9 March 2012. Retrieved 28 May 2010. ^ a b c d "Govt to set up authority to probe air accidents". Deccan Herald. 25 June 2010. Archived from the original on 9 March 2012. Retrieved 26 June 2010. ^ "Pilot error behind Mangalore crash: Report". CNN-IBN. 16 November 2010. Archived from the original on 9 March 2012. Retrieved 11 April 2011. ^ Kaminski-Morrow, David (26 April 2011). "Overrun Air India 737 could have stopped despite late landing". Flight International. Archived from the original on 14 March 2012. Retrieved 26 April 2011. ^ a b c "Court of inquiry to investigate Mangalore crash". Times of India. 3 June 2010. Archived from the original on 1 March 2012. Retrieved 4 June 2010. ^ a b Raghuram, M. (8 June 2010). "IX-812 black box is in fine shape: Probe head". DNA. Archived from the original on 1 March 2012. Retrieved 8 June 2010. ^ a b Raghuram, M. (17 August 2010). "Crash victims were asphyxiated". Times of India. Archived from the original on 1 March 2012. Retrieved 18 August 2010. ^ "Court of Inquiry in air crash begins hearing". Chennai, India: The Hindu. 17 August 2010. Archived from the original on 1 March 2012. Retrieved 18 August 2010. ^ a b "Co-pilot's cries went in vain". Deccan Herald. 18 August 2010. Archived from the original on 1 March 2012. Retrieved 19 August 2010. ^ a b c Fernandes, Ronald (20 August 2010). "M'lore crash: Pilot may have tried to take off". Deccan Herald. Archived from the original on 27 February 2012. Retrieved 20 August 2010. ^ a b c d "Mangalore Crash: Pilot Was Asleep before Crash: Black Box Data". Daijiworld Media. 8 September 2010. Archived from the original on 27 February 2012. Retrieved 8 September 2010. ^ "Mangalore crash: Pilot nodded off". Hindustan Times. 16 November 2010. Archived from the original on 16 February 2012. Retrieved 17 November 2010. ^ Hradecky, Simon (16 November 2010). "Probe panel confirms pilot error caused M'lore crash". Deccan Herald. Archived from the original on 15 February 2012. Retrieved 26 April 2011. ^ "Crash: Air India Express B738 at Mangalore on 22 May 2010, overran runway on landing". The Aviation Herald. 26 April 2011. Retrieved 27 April 2011. ^ a b "Kin of crash victims to get up to Rs 76 lakh compensation". NDTV. 22 May 2010. Archived from the original on 13 February 2012. Retrieved 9 September 2010. ^ "Karnataka govt announces compensation". Times of India. 22 May 2010. Archived from the original on 13 February 2012. Retrieved 9 September 2010. ^ "General Conditions of Carriage". Air India. Archived from the original on 12 February 2012. Retrieved 25 May 2011. ^ "Air India Announces Interim Compensation for Mangalore Air Tragedy Victims". Press Information Bureau, Government of India. 23 May 2010. Archived from the original on 12 February 2012. Retrieved 12 June 2010. ^ "Air India offers jobs to crash survivors". The Hindu. 23 May 2010. Archived from the original on 12 February 2012. Retrieved 12 June 2010. ^ "Rs 17 crore relief paid to families of Mangalore crash victims". DNA. 11 June 2010. Archived from the original on 12 February 2012. Retrieved 12 June 2010. ^ a b c "DYFI joins crash victims'cause". Times of India. 8 September 2010. Archived from the original on 12 February 2012. Retrieved 9 September 2010. ^ "Air crash victims' kin stage stir against meagre compensation". Deccan Herald. 8 September 2010. Archived from the original on 11 February 2012. Retrieved 9 September 2010. ^ a b "Mangalore AI crash victims to get Rs 75 lakh each". Times of India. 20 July 2011. Archived from the original on 11 February 2012. Retrieved 20 July 2011. ^ "Stay on Rs 75 lakh compensation to Mangalore crash victims". Hindustan Times. 25 August 2011. Archived from the original on 11 February 2012. Retrieved 9 February 2012. ^ "Give Rs 10 lakh to Mangalore crash victim: HC tells Air India". Deccan Chronicle. 6 September 2011. Archived from the original on 11 February 2012. Retrieved 9 February 2012.